(VOVWORLD) - By early Tuesday morning, a spokesman for Paris police says the Notre Dame fire is now under control. The steeple of the landmark Notre Dame cathedral collapses as the cathedral is engulfed in flames in central Paris. 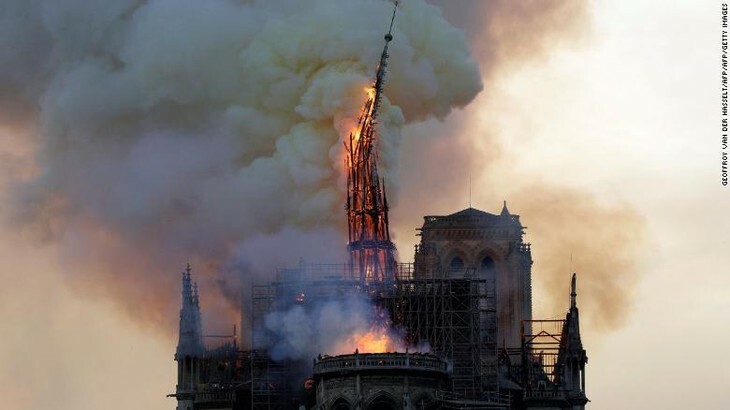 The fire burned for several hours Monday, causing the collapse of the cathedral's iconic spire and the destruction of its roof structure, which dated back to the 12th century. Consumed by flames, the spire leaned to one side and fell onto the burning roof as horrified onlookers watched. Paris Mayor Anne Hidalgo said that major art pieces and sacred items from Notre Dame were saved from the fire. Parisians raised their voices in song Monday night outside Notre Dame Cathedral as a massive blaze engulfed one of the city's most revered historic sites. French President Emmanuel Macron praised firefighters for saving the cathedral's iconic facade and towers, saying "the worst has been avoided." Yet he lamented the damage already done to "the cathedral of all French people." He pledged to launch an international fundraising campaign to rebuild the cathedral.